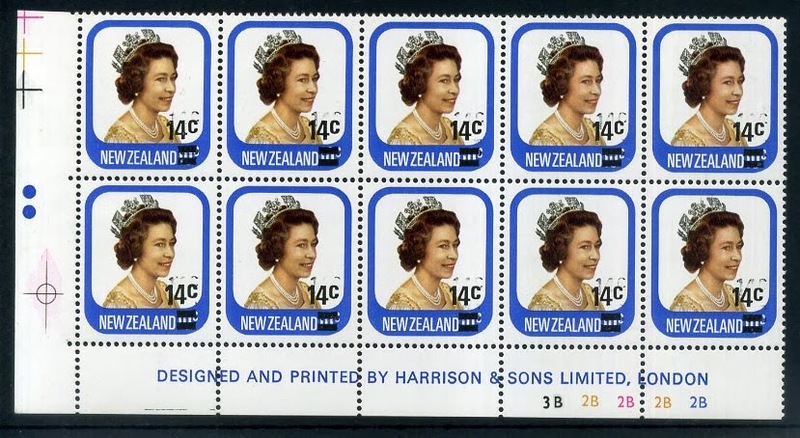 Virtual New Zealand Stamps: 1975 Definitives / Pictorials - Part Four. 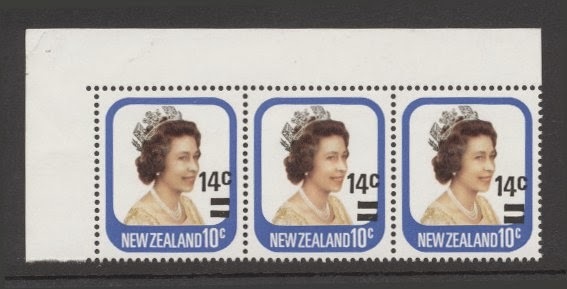 1977 10c Queen Elizabeth II & 1979 14c Overprint. This post is was originally published as a separate post but we have decided include it where it should be, in this series on the 1975 Pictorials. While we repeat some of the information included in Part Two, we've decided to leave this page as close as possible to the one we originally published. 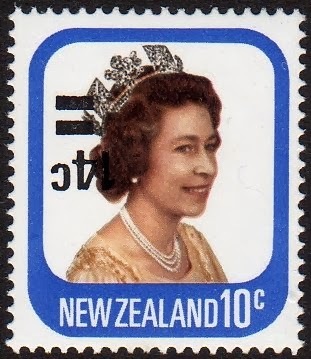 Intended as an addition to the 1975 Definitives, the 10c depicting Queen Elizabeth II, was issued in 1977 to meet a demand cause by a change in postal rates. 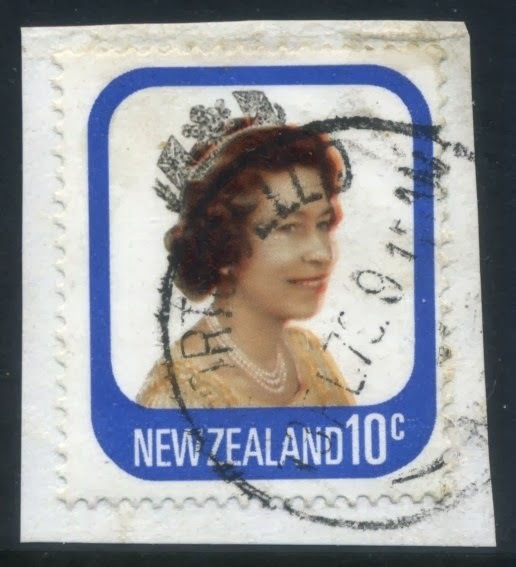 Valued at the new letter postage rate of 10c meant this was a very common and well used stamp. 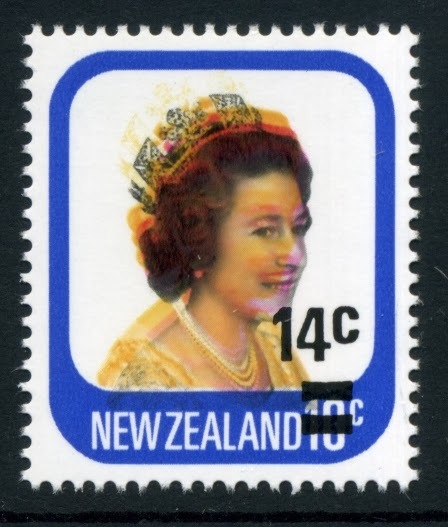 In 1979 another change in postal rates meant the 10c value was no longer required for ordinary letters so the stamp was overprint with two solid bars over the old value and a new value of "14c." 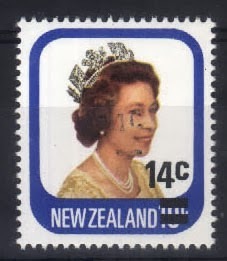 This type of stamp is commonly known as a Provisional. 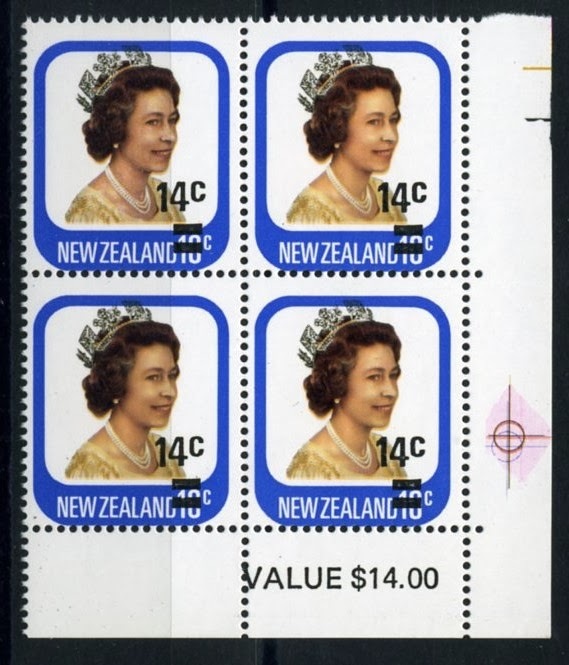 There is the younger sister to the left 1979 14c QE II overprint. So that is the basic story of this stamp. One design and a value overprint two years later. 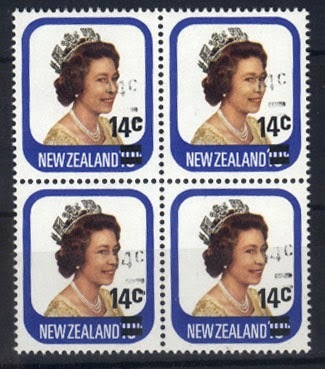 Since both these stamps were commonly used, large numbers printed and further reprints required. 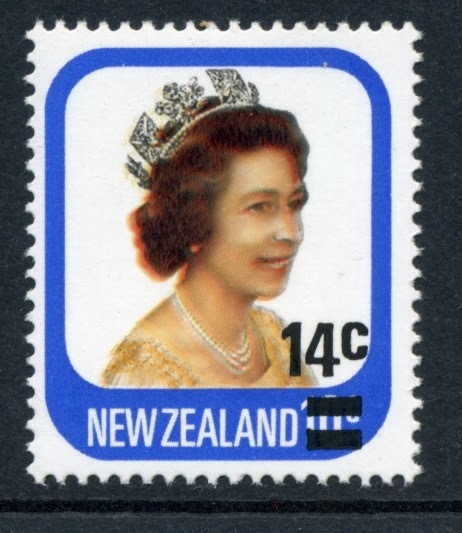 What makes this stamp so interesting is the large number of printing errors which can be found in both the original stamp and in her provisional sister. 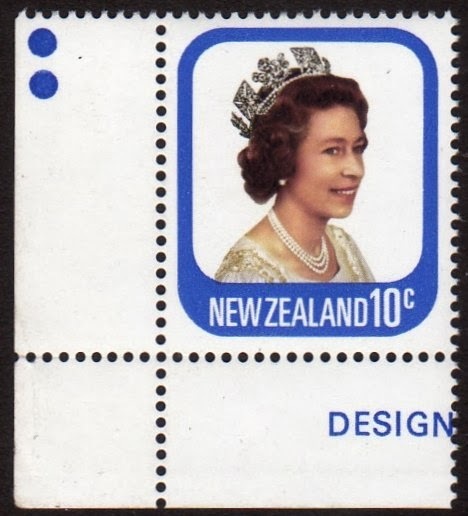 The design was a simple portrait taken from the 1977 Silver Jubilee Issue which can be seen above. 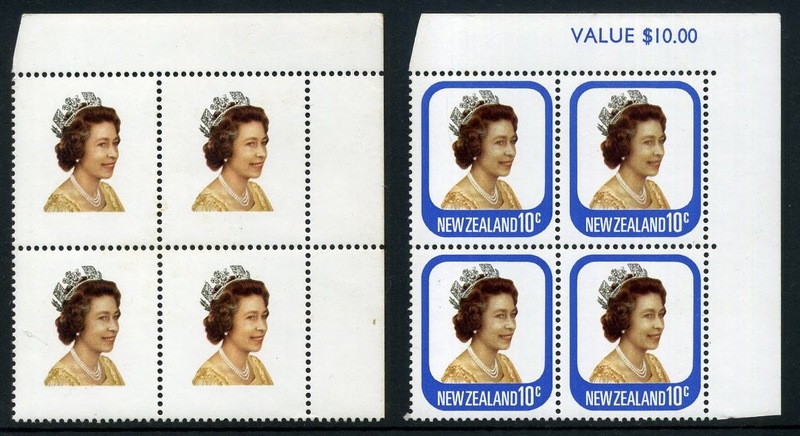 The second photo from the left was used which shows the Queen's facing towards the right, wearing a crown. 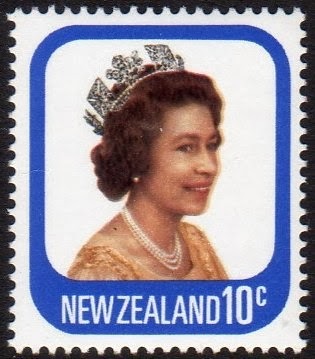 Below, when you compare this stamp with the definitive versions you will notice that the Queen's shoulders has been trimmed off, making the picture more square than rectangle. 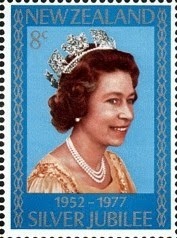 1977 Silver Jubilee Issue - 8c. Definitive Versions 10c and 14c. 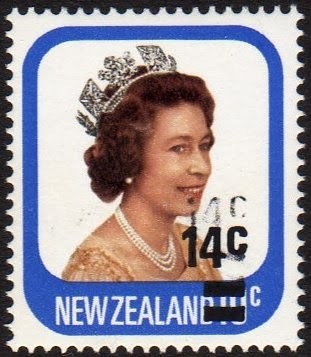 The normal stamp today is listed as $1.30 mint - 50c used. Our first two flaws are concerning the blue used for the stamps border. In the block of four above the blue is a lot lighter than usual. At the top, part of the border has almost completely gone. 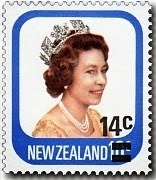 Then on the single stamp above right, the blue has been omitted completely. Below are two value blocks, actually the same value block, but from two different sheets. On the right is a normal example. Notice the value is $10.00 which means there must have been 100 10c stamps in the sheet. The example on the left is the same value block except the blue has been omitted removing both the design border and the sheet value. During printing extra heavy coating of the blue border caused the blue to offset onto the back of the sheet above as can be seen in the example below. Offset became a big problem two years later during the 14c overprint. Over inking could also cause problems on the front as well. 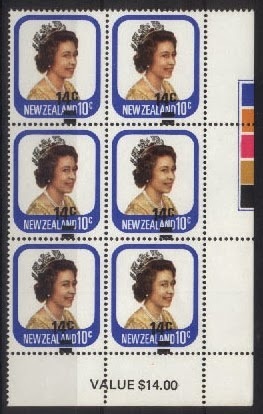 In this block below we can see all three of the lower stamps have been effected by an ink mark which runs across them. In the third stamp this can be hardly seen but in the first two it is very bad. Next we will look at colour shifts of the other colours. Some of these are minor while you will find a few are quite spectacular. Fine colour shift leaving a double edge to her face. Notice how this image makes you blink thinking its your eyes before you realise its the printing. When things really go wrong the result can be quite spectacular. In these cases a crease in the paper caused part of the sheet to end up like this. In both cases there are two colour shifts which make the effect you see above. 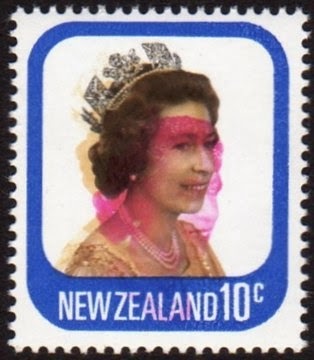 When you compare these two stamps to the minor colour shift above them you get a clear view of how important the magenta is in this design. The Queens face has become dull, almost a washed-out appearance and the rich brown is lost from her hair. This final example shows the orange colour omitted. Next we will look at the perforation process as see what can go wrong there. Perforating is usually done at a later stage in the printing process and is most often done on a different machine. It also depends on the sheet being placed in the correct position before the holes are punched using a mechanical process. Originally they were cut using one or more wheels which were rolled across the paper. 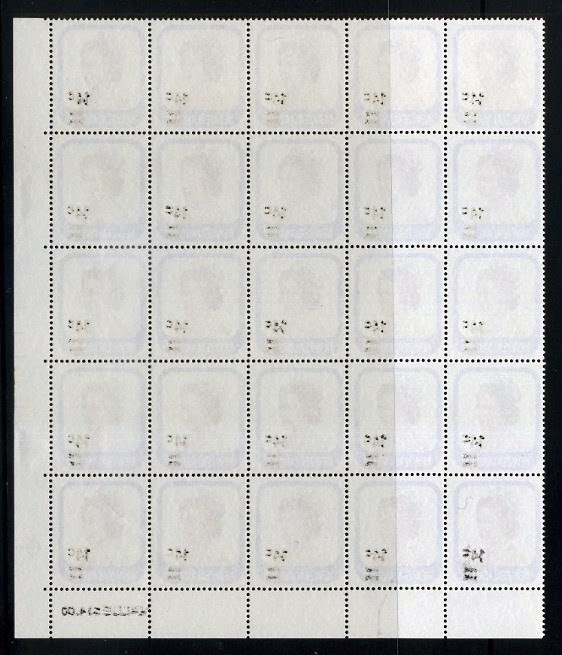 By the time of this issue the entire sheet was cut at the same time, which meant if one stamp was cut wrong then the other 99 were too. 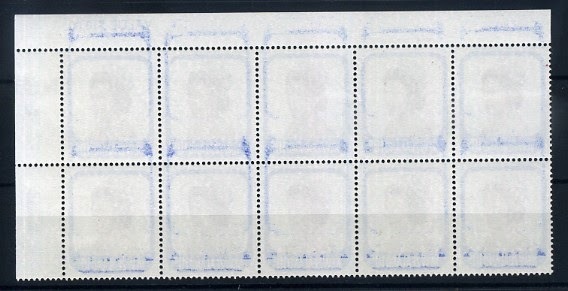 On the left is a value block from the top right hand corner of the sheet. If you look closely you will see the perforation has made an impression but not broken through the paper. This is know as a blind perforation. On the right hand block above, the perforation has shifted upwards cutting into the design at the bottom and including some of the stamp above at the top. This would become very noticeable once the stamps are separated. Two examples of Imperforate Pairs, which have not been perforated at all. The vertical example on the left has a minor colour shift as well which gives a blurring of the image. until after the stamp had been used as seen here. This example shows a minor colour shift. 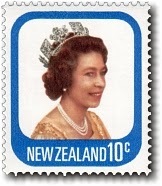 In 1979 the standard postage rate was raised from 10c to 14c. 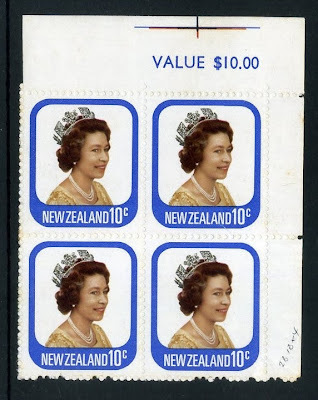 Since there were large stocks of the QE II 10c it was decided to overprint them with the new value. This led to an entirely new range of printing errors, both in the printing of the original design and in the overprint itself. 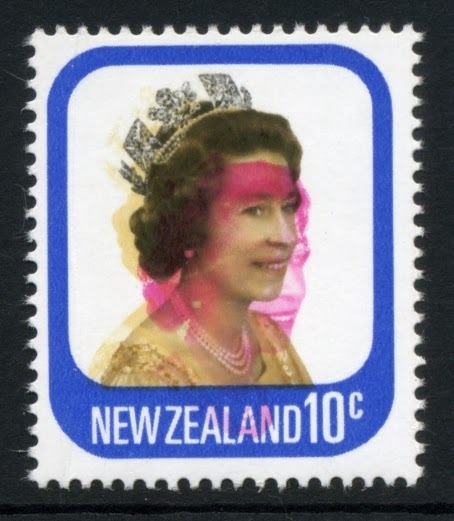 First we will look at errors in the original stamp before overprinting then we will look at errors in the overprint itself. In the examples above and below we find various colour shifts during printing of the original design. The one above left is a fine mess caused by three colours misplaced. 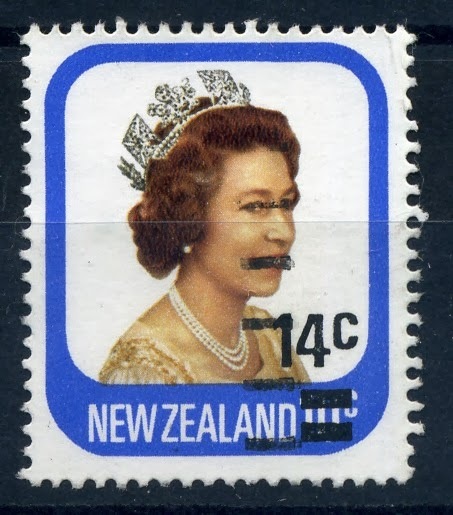 You could say there was more wrong with it than there was right with this stamp. To the right above is an smaller colour shift of the red/magenta best seen on the back edge of the hair. In the block below left, we have a vertical colour shift of the blue. 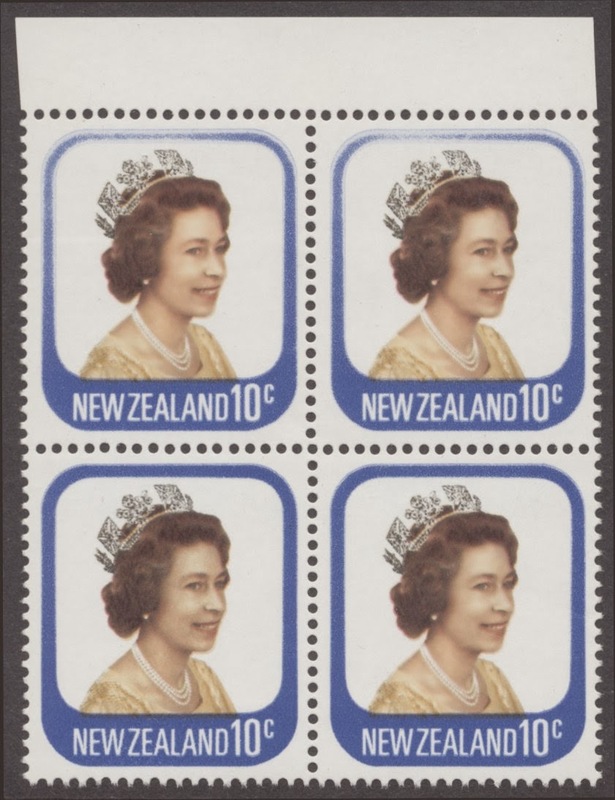 Notice the blue border is touching the perforations while leaving a white gap under the Queen's portrait. On the right is a larger shift of the red. 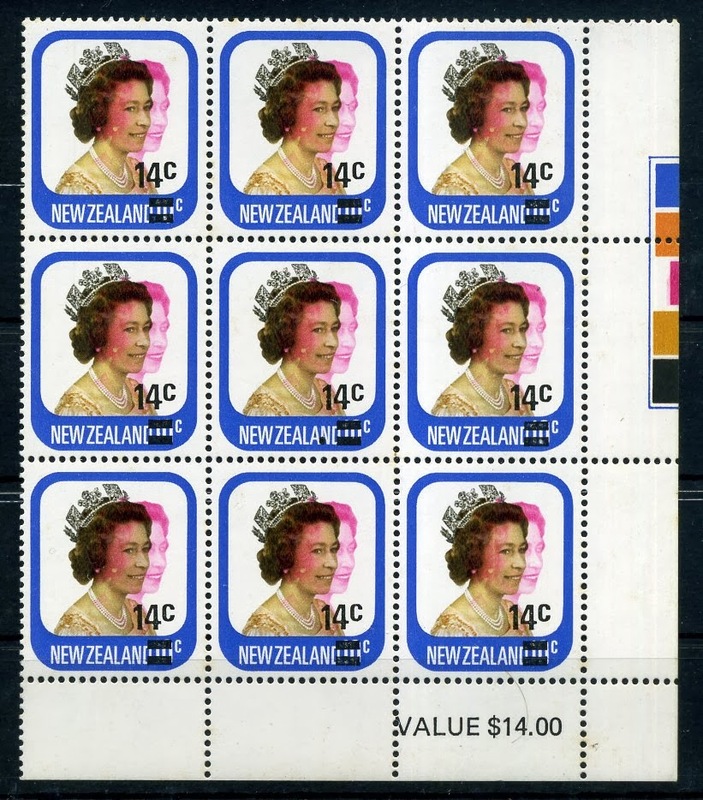 Notice that the overprint is out of place on some of these examples too. 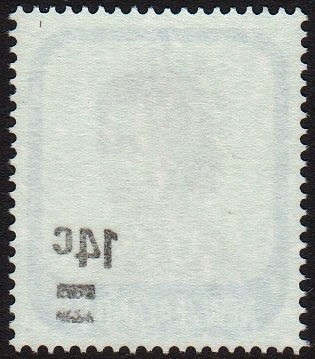 The above right stamp shows the overprint in the correct position making it impossible to read the value underneath. On the example above left the original 10c value can easily be seen. It is similar with the examples below too with the right hand one being correctly placed. Below is a value block with a large side shift of the magenta. This would be a fine addition to any collection. 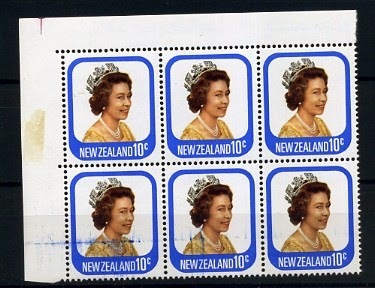 Nine stamps joined together like this would add to the value of each stamp. On the right hand side is the printers colour tabs by which he can see the colours that have been added to the design. You can see how far the magenta tab has been moved to the right. This block could be worth as much as $800,00. Finally we get to errors in the overprint. 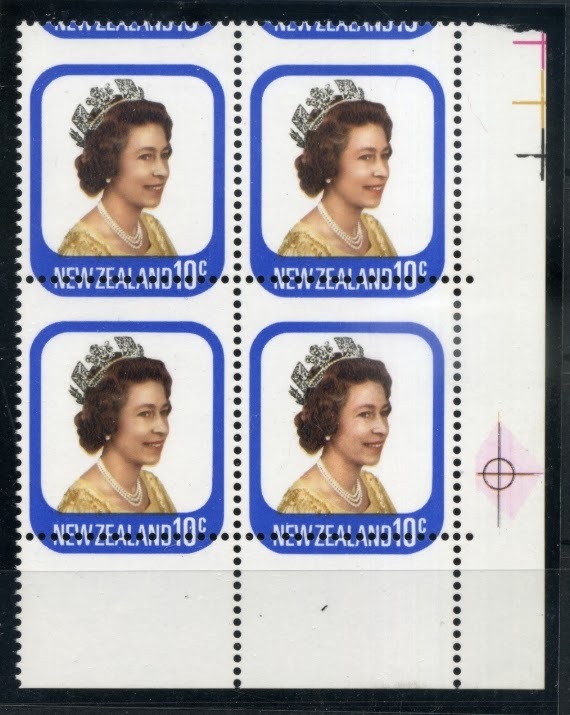 Above left the sheet was feed through the machine the opposite way causing the overprint to appear inverted to the top left instead of the intended bottom right. On the stamp to the top right we find the overprint has become offset on to the back of the stamp above leaving this impression on the gummed back. Below is a value block of the same problem where even the new sheet value is shown to be offset too. The in some cases the overprint also got printed twice during printing, in an error known as a double strike. 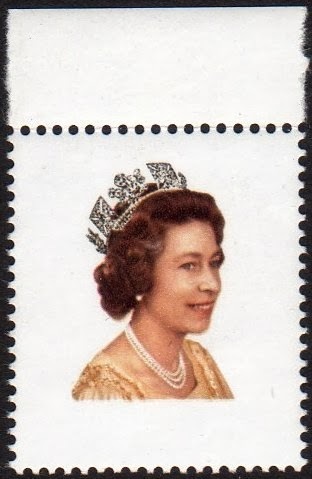 In the example to the left the second strike appears over the Queen's face. 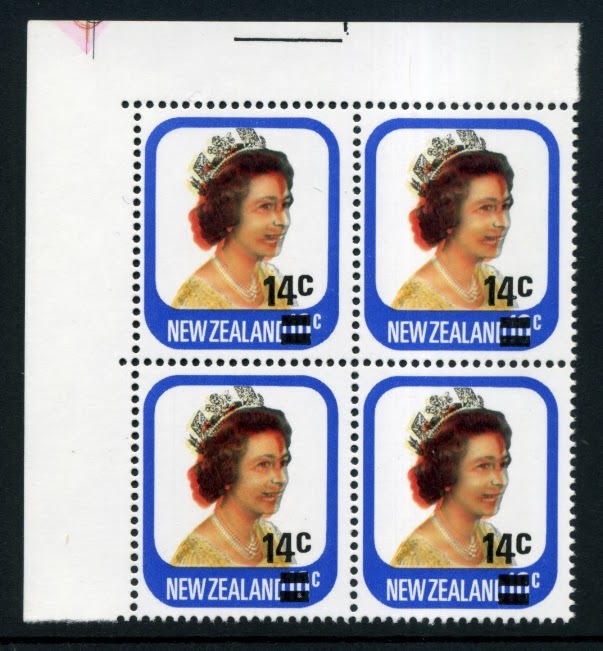 Above is a block of four stamps showing a second strike of the overprint. A single copy of this error is listed by Campbell Paterson at $350.00 to $400.00. This block of four was recently offered for sale at $500.00. Below is a similar error except the two strikes are now much closer together. What makes this block so interesting is the fact that it is a plate block, complete with the printer's name and plate numbers. Judging by the number of errors in this post, maybe the printer should have left their name off the sheet. On the plate block above and the value block below you can see marks used during the printing process. In the example above you can see five numbers in different colours below the printers name. These are printing plate numbers so they know which plates were used to produce the printed image. In the example below the printers tabs can be seen. These are used to test for both position and colour. Since the design is made up of a variety of colours over each other a place is required where the true colour of each impression can be seen is important so tabs like these are added to the margin. This plate block is worth around $500.00. Here are two examples of shifts in the overprint that are so great that the original value is not been covered at all. The block above was recently offered for sale at $300.00.